WordPress Pokhara October Meetup 2018 is Tomorrow! The WordPress Pokhara community has announced a local meetup to be held for the month of October – WordPress Pokhara October Meetup 2018. The meetup will be held tomorrow, on 31st October 2018 at Unistar Education in Siddhartha Chowk, Pokhara. The meetup will kick off at sharp 7:30 A.M. and will last till 9 A.M.
WordPress Pokhara October Meetup 2018 is going to be a basic meetup covering various topic regarding WordPress. 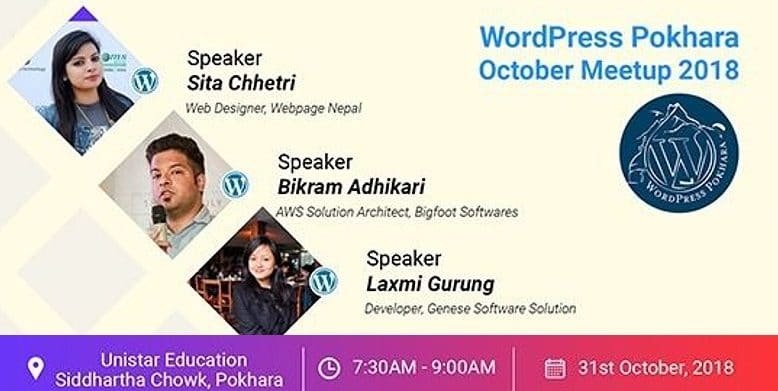 The speakers for WordPress Pokhara October Meetup 2018 are Sita Chhetri from Webpage Nepal, Bikram Adhikari from Bigfoot Softwares, and Laxmi Gurung from Genese Software Solution. All of these three WordPress personalities are also going to speak at the upcoming WordCamp Pokhara 2018 in November. WordPress Pokhara October Meetup 2018 is an open program and welcomes every WordPress enthusiasts. The entry to this meetup is completely free. Also, you will get a chance to meet the speakers and other WordPressers during the networking session which will take place after the meetup. For more details, check out the official event page on Meetup. And, you can also follow the official Facebook group of WordPress Pokhara to keep up with the latest news and events regarding WordPress. You can also contact Mr. Pitam Bahadur Sen (9802826697) or Mr. Nishal Gurung (9856000849) for more details. If you have anything to ask, add or share, please let us know through the comments section. We’d love to hear from you. WordPress Meetups are casual meetups for basically anyone who uses and works or wants to work with WordPress. The Nepali WordPress community organizes meetups in Nepal on a monthly basis, and it is an excellent opportunity to exchange ideas, examples, support & answers regarding WordPress.